I really hope my family isn't reading this blog, or they are finding out what all their Thanxmas presents are. 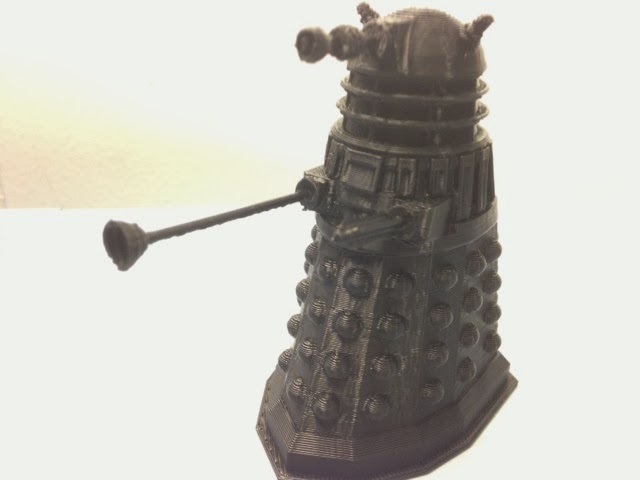 To continue yesterday's theme, today we are printing guydebored's great Dalek model from Thingiverse. Settings: We printed the body on .3mm/low without raft or supports, and the weapons on .15mm/high with both raft and supports (in the horizontal position). It was a little fiddly to remove the supports but was worth it in the end. We had to trim the ends of the weapons a bit to fit into the holes on the Dalek. It looks really great since you imagine it all printed in one piece with the impossible overhangs that the weapons would cause. Wonderfully done model, thank you guydebored!